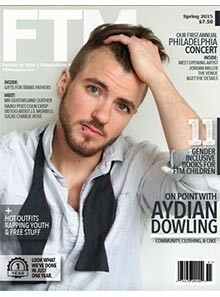 The Spring 2015 issue of FTM Magazine features Aydian Dowling, the founder of Point 5cc Clothing company, binder exchange and surgery fund. Aydian has been an inspirational model for transgender men all over the world for years with his YouTube channel ALionsFears. FTM Magazine is dedicated to the lives and culture of the FTM and Trans-masculine community.